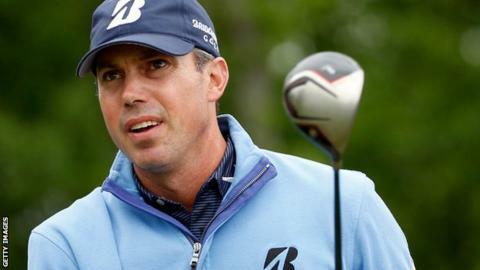 American Matt Kuchar will take a four-shot lead into the final round of the Shell Houston Open after Sergio Garcia's title challenge faded. Kuchar, 35, carded a four-under-par 68, while Spain's Garcia shot 73 after leading at the halfway stage. Garcia is tied for second with American Cameron Tringale on 11 under, in the last event before the Masters. England's Luke Donald and Lee Westwood are three under and Northern Ireland's Rory McIlroy two shots further back. Garcia, 34, shot a flawless 65 in the second round to match the 36-hole course record of 12 under and lead Kuchar by one shot. But he carded a bogey on the opening hole as playing partner Kuchar seized the initiative with a round that included six birdies, including three in a row on the 12th, 13th and 14th. The world number 11 finished with a three-putt bogey on the 18th, only his third dropped shot of the week. Kuchar - seeking his first PGA Tour victory since winning the WGC Match Play last year - was fourth at last week's Texas Open after being tied for the lead with nine holes remaining. He said: "It's a nice position to have played well last week, to have been in the last group with a chance to win and to come back this week and have another shot to win."